White wool/acrylic twill vest and pants; gold buttons; patch pockets. 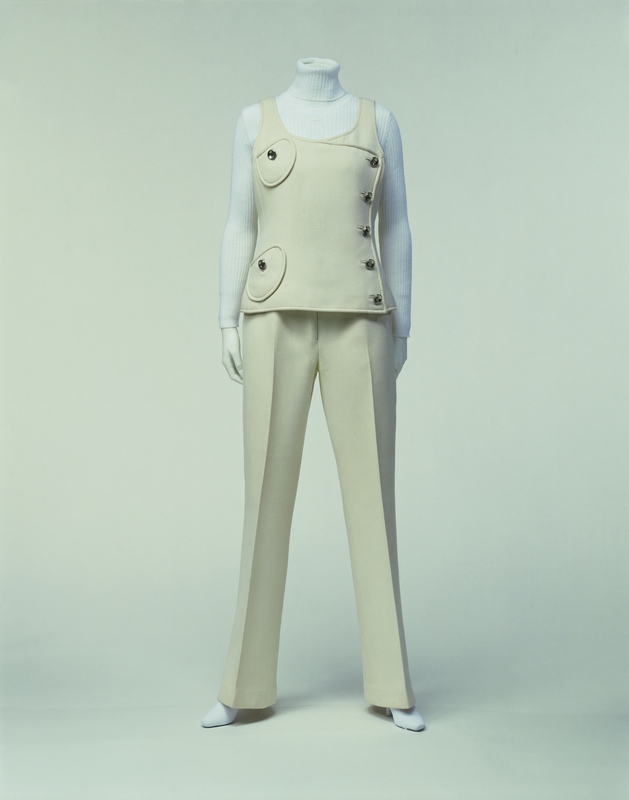 This pantsuit, an example of the women's pants style that André Courrèges had been producing since 1963, features subtle cutting that captures the soft lines of the body. Courrèges had introduced pants to haute couture along with Yves Saint Lauren, but unlike Saint Lauren, he had not adapted menswear styles, instead creating completely new styles for young and youthful women. In the 1960s, youth was a pivotal keyword, and fresh, clean images were highly valued. Courrèges' white spoke to people's admiration for the brand new. André Courrèges had worked for 11 years from 1950 as a cutter for Balenciaga, who was reputed to have been the last true couturier, and made good use of the precise techniques he had learned to make constructive clothes. The rigorous approach he had inherited from Balenciaga ensured that the brand retained its reputation for quality even when it expanded.